Kath – Live. Laugh. Love. Lake. Wow, this summer went by so fast! I had so many blog posts written in my head that I planned to publish over the course of the summer, and then before I knew it, it was October. To be fair August didn’t really feel like summer. But thanks to Hurricane Maria we had a crazy spell of 90-degree days in September, which inspired me to revisit my half-written posts. We didn’t end up taking the boat on a week-long, halfway around the mitten trip as we’d hoped last year. It turns out there’s a bit more to a multi-night boat trip than just deciding to take five days off from work and heading out. 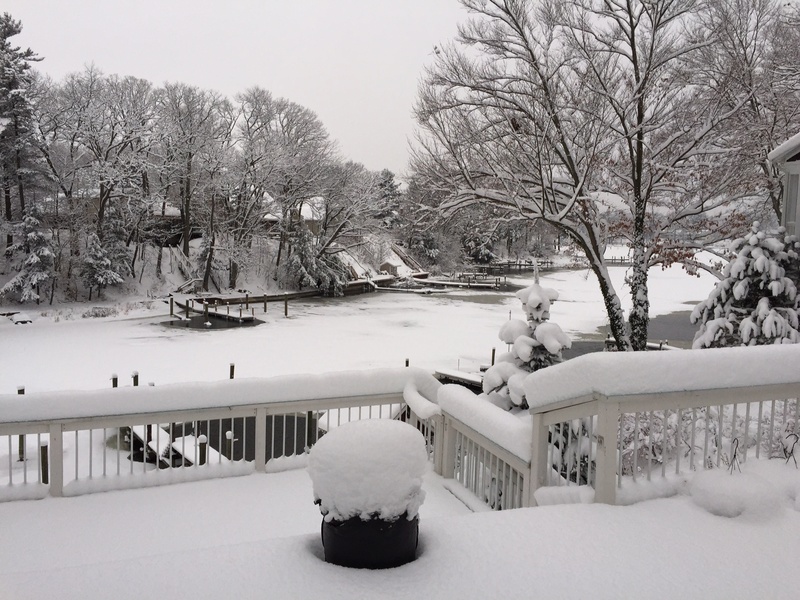 For one thing, weather plays a major role (I know – news flash!!). In fact, at least in Michigan, I think that realistically it would take two full weeks or more to pull off an eight- or nine-night trip. But we did get some good overnights and one multi-night trip in, and so I’m sharing a little recap of our 2017 boating adventures. A calm morning in Holland, looking out at Lake Macatawa. One plan we made last year that did stick was bringing our bikes on our overnights. It really makes a remarkable difference in the ability to truly explore every port – and also allows us to get a bit more exercise than we’d get from just walking. Having our bikes for overnights is a game-changer. Great exercise and you can’t beat the views! 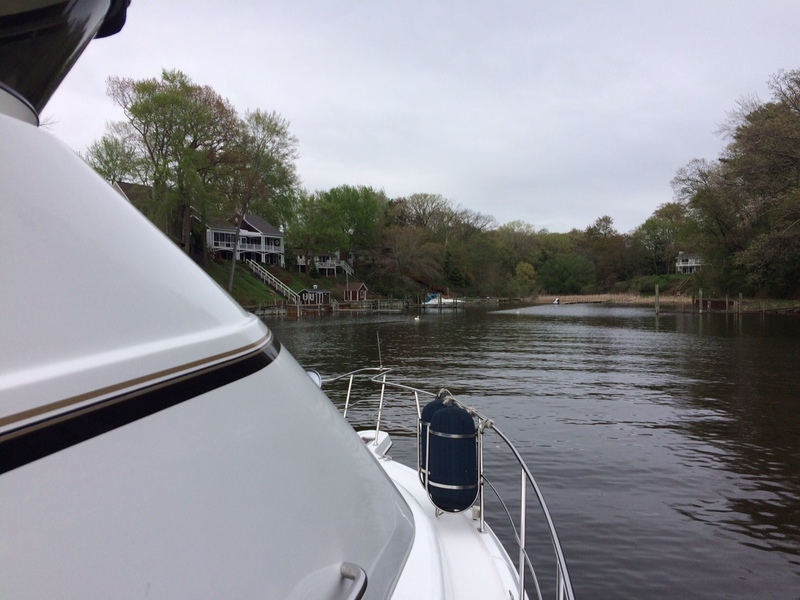 We kicked off the Summer 2017 Overnight season in Saugatuck, a longtime favorite getaway town for us. 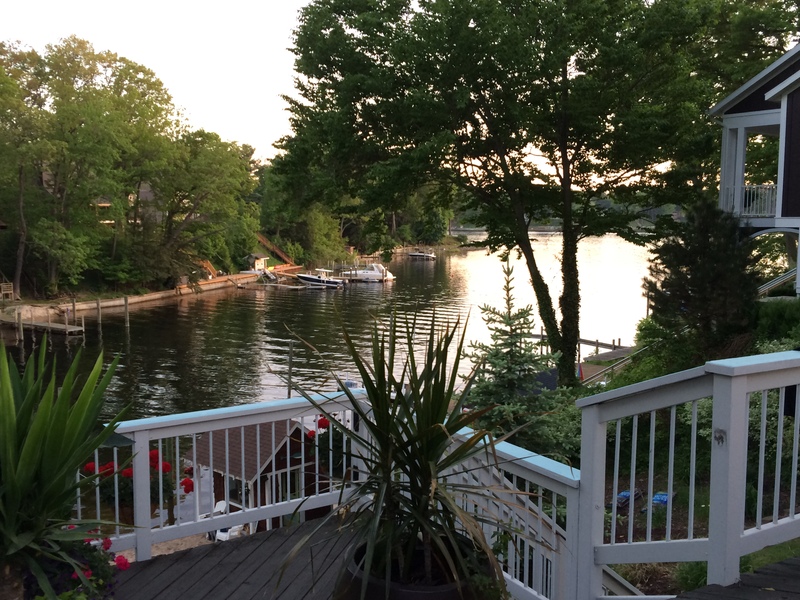 We have done several boat overnights in this charming community, but this year was the first time we stayed in nearby Douglas AND took the dinghy across the lake to the town of Saugatuck. In fact, this trip was when we really discovered the joy of dinghy ownership. In 2015 when we first bought the boat, there was so much to learn it was too overwhelming to try to figure out the dinghy (not to mention we were also planning a wedding so probably a tad distracted), but last year we gradually started taking it out on little jaunts on Spring Lake. Since then we’ve realized that the dinghy brings a whole new level of freedom to our excursions. Taking the dinghy across Kalamazoo Lake to Saugatuck on our first overnight of the season. Favorite spots: Coral Gables for patio dining, live Jimmy Buffet-esque music and some serious boat watching; the Butler for more outdoor dining and live music; Wally’s for indoor/outdoor seating, live music and dancing; and Phil’s for a beer and good bar food any time of day or night – plus our favorite bar pastime, dirty-word Hangman. 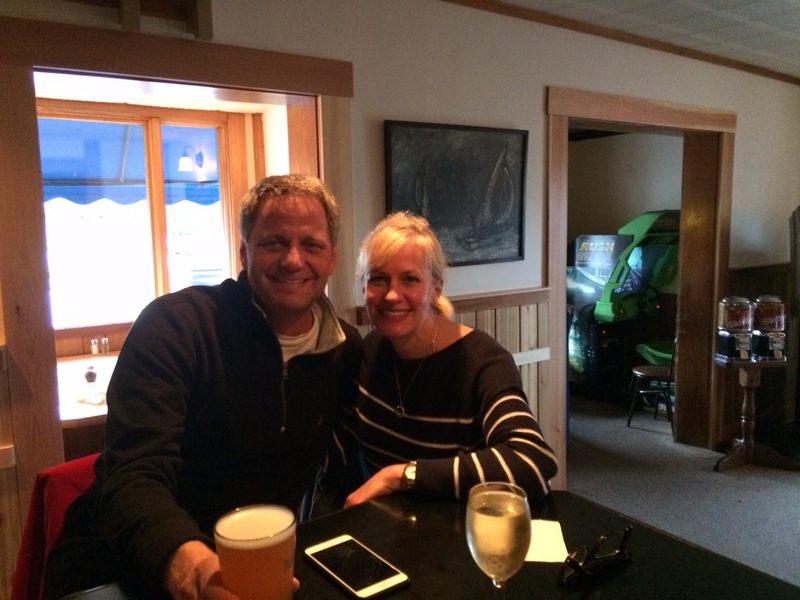 This was taken a few years ago when we docked late on a Friday night and were happy to find anyplace in Saugatuck still serving food. Phil’s Bar and Grille is a great place to grab a late-night snack and play dirty-word Hangman. Next up was Muskegon. 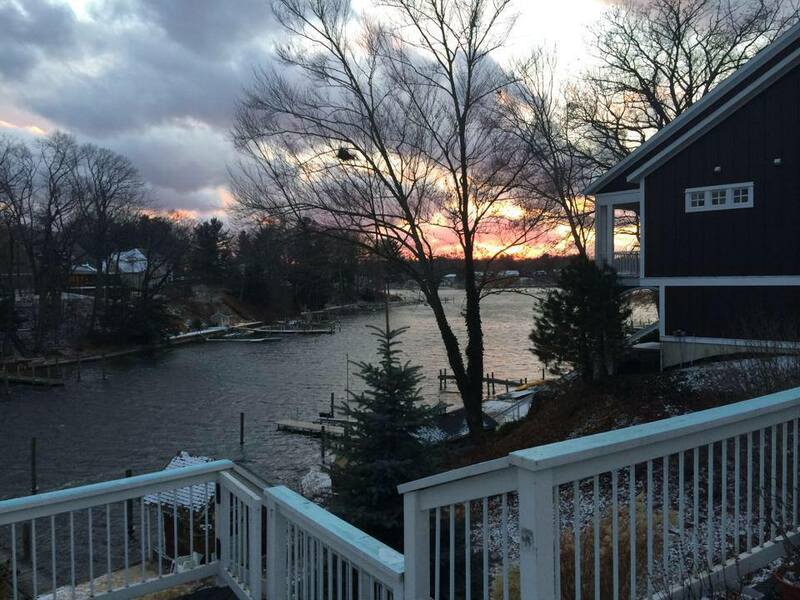 This lakefront Western Michigan town is on the rise! We stayed there twice this summer and made wonderful little discoveries both times. One of the happiest moments for me was finding out that my favorite wine bar, Smash, had been reopened. That place is so cool and I was sad when it closed last year. But it’s now under new ownership, and I really hope it can keep going. 18th Amendment, a new distillery, was another awesome spot we stumbled onto. We enjoyed their creatively named cocktails and the pizza was delish. The Tipsy Toad has a fun rooftop bar area that we usually try to visit for one quick drink. Some non alcohol-focused highlights include the Muskegon Farmers Market – we managed to squeeze in two stops there, both with bountiful results. Another must-visit place is The Cheese Lady, which, in addition to having an incredible cheese selection, offers gourmet snacks, wine, olive oils, gifts, and more. The Cheese Lady is a charming gem of a cheese shop in downtown Muskegon. Kicking off a night on the town in Muskegon with a stop at the Tipsy Toad. On our second trip to Muskegon we stayed at the Great Lakes Marina which is a bit further from downtown, but with our bikes, it was a super easy ride into town. We discovered the bike trail, which made the trek to and from town a pleasure and allowed us to avoid much of the downtown traffic. 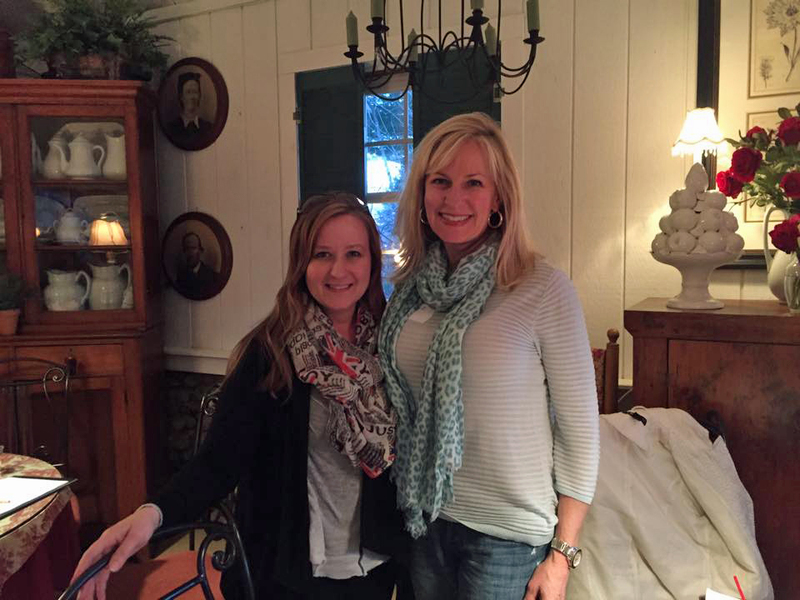 We also found that hanging out in the Lakeside neighborhood near the marina was a fun, easy way to stay local. There are several bars in stumbling distance, and just outside the marina is a little hotdog joint, Max N Marley’s Doghouse. They have a million different hotdog options including a breakfast dog, a taco dog, a gyro dog and many more. On a whim we decided to get our lunch to go and enjoy it on the bow of the boat with a glass of wine. While I’m sure their hotdogs are always good, somehow they were magical when eaten on the bow of the boat. We neglected to get a picture of our hotdogs, but they were amazing and just the ticket after a busy morning of biking around town. Worth stopping for a dog if you’re ever in Muskegon! Later we took the dinghy across the lake to Dockers, a longtime favorite spot for us. We’ve gone there by boat several times but it was a novelty to take the dinghy. Known for their tiki bar and over-the-top Bloody Marys, this boaters paradise is only open for the summer season so it’s always packed. We spent both our first and second anniversaries at the Eldean Marina in Holland, so I’m thinking we can call it our anniversary tradition. We love Holland and we love the marina. The only drawback is that it’s quite a hike outside of town (about five miles) so it’s not super convenient to go back and forth. Fortunately Uber is now available in Holland, plus this year we took our bikes so we were a bit more mobile. Favorite spots: The Holland Farmers Market is fabulous!! Jam-packed with hyper-local produce plus fun and funky crafts and homemade food products. The downtown is thriving, with lots of locally-owned boutiques and gift shops as well as a few retail chain stores (think White House Black Market, Chico’s, etc.). Some eateries we enjoy are the 8th Street Grille for the amazing soup bar; Boatwerks with waterfront seating on Lake Macatawa; New Holland Brewing Co. for fantastic local beer; and Curragh Irish Pub for last call. I have a tendency to over-buy when we visit farmers markets during boating trips. Everything is so tempting and I’m always convinced I’ll use it all! The advantage of riding our bikes to and from Holland was that we were able to stop and ogle the seriously gorgeous real estate along S. Shore Drive. Here are just a few of the drool-worthy homes and gardens we passed. Talk about hydrangea envy!! I wish I knew how to grow them like this. Absolutely stunning. 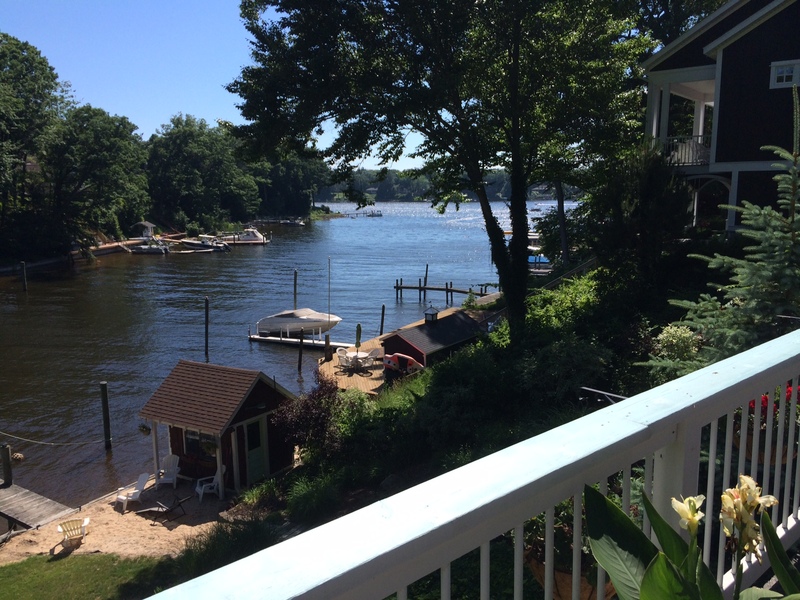 One of our favorite ports, Whitehall/Montague is less touristy and has a quirky, small-town vibe. It’s quite hilly and feels like you’re up north, plus the establishments have a definite local friendliness. The farmers market was more like a community meeting spot than a place for farmers to sell their wares, and the bookstore/coffee shop/wine bar seemed to be the kickoff-to-Saturday night spot for the locals. We were especially adventurous (well, my husband was, and I was dragged along), and we rode our bikes six miles outside of Montague to the Old Channel Inn, which is charming and has a decided Northern Michigan feel. Spotted on our bike ride outside of Montague. Stopping for a beverage at the historic Old Channel Inn, right on Lake Michigan outside of Montague. 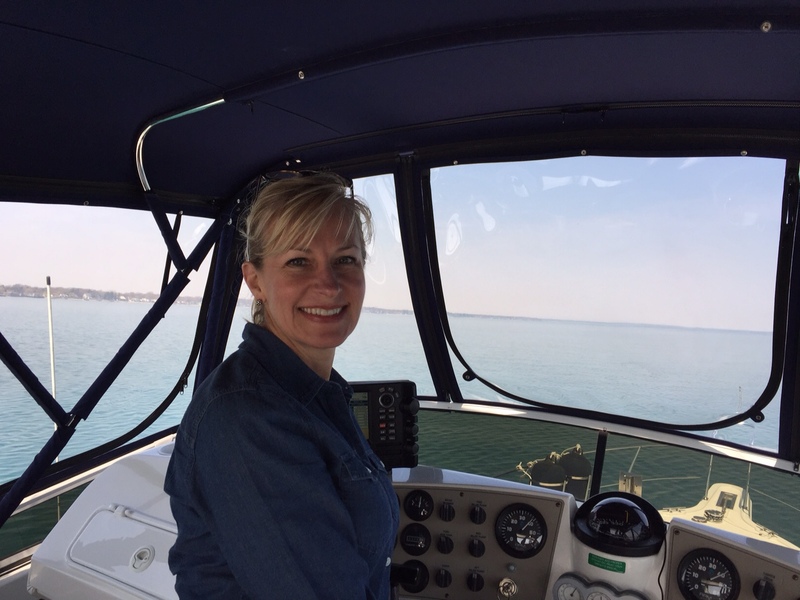 Marina lowdown: We’ve had fantastic experiences at the White Lake municipal marina right on White Lake. The staff is super helpful and it’s a convenient walk to both Whitehall and Montague. We even got to “witness” a wedding while docked there on our last trip (probably more enjoyable for this hopeless romantic than for my husband). What can I say? I’m a sucker for weddings. Favorite spots: Fetch Brewery (live music and board games), Pub 111 (live music and fantastic dance floor), Bardic Wells Meadery (because MEADE and also fun, quirky staff), Book Nook (combines four favorites: books, coffee, wine and live music), Old Channel Inn (for an off-the-beaten-path Northern Michigan experience). The Book Nook in Montague offers a unique blend of books, coffee, wine/beer and live music. That’s the rundown of our 2017 one-night excursions. Stay tuned for the recap of our four-nighter trip, coming soon! The closer we get to the 2017 boating season, the more nostalgic/reminiscent we get about previous, happy experiences aboard the Just Like Heaven. Our favorite so far was the three-night trip we took last September. We decided to do this outing somewhat at the last minute, much the way many boat trips end up happening. We had pondered a variety of different late summer/early fall vacations, then decided that one last boat excursion seemed doable. The tentative plan was to spend the first night in Pentwater, head up to Frankfort for the second night, and then make our way back south and stay in Ludington for a final night before heading home. We met right after work at the marina, where I left my car, and made our way to Pentwater. It’s ridiculous that as a lifelong Michigander, I’ve never been to this popular Lake Michigan town before, but this was in fact my first visit. The marina was right in the center of downtown Pentwater and once we were safely tied off, we explored town a bit and enjoyed dinner and drinks in the local establishments, including a “tiki bar” that seemed somewhat out of place in Northern Michigan but was nonetheless quite charming. Every Northern Michigan town needs a tiki bar! The next day I took a local yoga class and we spent a little more time checking out the quaint downtown. We were especially intrigued by a super funky, local antique shop that specialized in nautical antiques. We purchased a few vintage buoys that we thought we might use to decorate our boathouse. We also discovered a gift shop that had lots of paraphernalia for wine lovers, including a wine cup complete with a lid and straw (okay, it’s basically a sippy cup) that looked ideal for rough boating days. Once we got organized, we headed out to the next port, Frankfort. The trip was fairly uneventful, but it was a tad choppy and I was happy I had my new wine cup. Farewell Pentwater! On to Frankfort. On rough trips, a sippy cup for your wine comes in very handy! We had a reservation for a slip at a local marina, Jacobson, that promised lobster bisque in its little market and in general sounded quite lovely. The owner was on hand to help us dock (with far less anxiety than the Pentwater docking). This marina, too, was right in the heart of town and we ventured in to get the lay of the land. We learned that Zumba was offered at a local VFW hall the next morning, and also discovered that we needed beer. A very complicated beer flow chart. After a bit of strolling, we enjoyed a lovely meal at The Fusion, a local Asian/sushi restaurant that came highly recommended by one of my colleagues. My husband ordered the massaman curry and proclaimed it to be one of the best he’d ever had. This isn’t the prettiest food shot, but I can guarantee he enjoyed his dinner. If you ever visit Frankfort, a meal at The Fusion is a must. The next morning, we intended to head down to Ludington after I took my Zumba class and we got organized. However, the wind was gusting and after doing a bit of research (mainly by asking other boaters in the marina), my husband decided we were staying put for the day. To be honest, I was thrilled. I loved Frankfort, absolutely LOVED the marina, and was excited about having a day to hang and explore the town. We hopped on our bikes (first time we’d actually brought them along on an overnight, but something we will be sure to do for all multi-night trips in the future) and rode out to Elberta Beach, where we confirmed our decision to stay put. The waves were dramatic to look at… but too dramatic to be boating on. We stopped for a beer at a local joint and made our way back to the marina. These waves confirmed our decision to spend another night in Frankfort. It was actually a warm day though – perfect for riding our bikes and exploring the area. The Jacobson Marina in Frankfort is, in my opinion, the nicest we’ve ever stayed in. The bathrooms/shower areas are practically spa-like, with air conditioning, roomy showers, clean, spacious counters, makeup mirrors and excellent lighting. Unlike most other marina bathrooms, this one made getting ready for a night on the town almost an event in itself. Ahhh, the boating life. Rosé on the bow makes all stress melt away. That night we enjoyed a few stops at the local bars and ended up eating dinner at the Hotel Frankfort, where we had the world’s largest piece of whitefish. We ended the evening by taking a stroll along the boardwalk and catching a glimpse of the full moon before getting a soothing night’s sleep on the boat. A beautiful evening in Frankfort. The next morning we headed out early. Rich wanted to avoid the rough waters that were predicted that day, and while the first part of the trip wasn’t too bad, we still experienced some jaw-breaking, bone-jarring waves. The shining sun and blue skies were deceptive – the wind roared and we crashed our way for most of the trip home. The big lake was angry that day, my friends. This deceptively pleasant photo of our trip home was taken before the water got too rough to do anything but sit and tough it out. Despite the brutal return trip, we enjoyed our adventure so much we decided then and there that our next excursion was going to be an eight-day, halfway around the mitten trip that hits all our favorite spots along the way. The trip will definitely include stops in both Pentwater and Frankfort. We will bring our bikes, and the dog may even get to come along. Stay tuned! Home port… always a welcome sight. Last summer my daughter asked me to try to replicate California Pizza Kitchen’s Quinoa-Arugula Salad. After a few attempts, I think I’ve got it down. It’s a fantastic salad that’s bursting with flavors but not heavy at all. It makes for an easy, delicious weeknight meal and, if you have leftovers, it’s great for lunch the next day. Even my husband and son, who would normally prefer heartier fare, enjoy this dish. On the CPK menu, chicken, salmon, or shrimp are optional add-ons. I’ve made this with shrimp once or twice, but salmon really is the best. What’s nice about this recipe is that nothing really needs to be finished at the exact same time so you can sort of make it at your leisure. I usually get the salmon on the grill, then get the quinoa going. While that’s simmering, I’ll roast the asparagus. I do like to take the extra step of toasting the pine nuts, but I do that last so I can watch them and make sure they don’t burn. Everything can finish in its own time, and then sit at room temperature for a little while until you chop the veggies and make the dressing. And if you buy the packaged arugula and the pre-crumbled feta, there really isn’t a ton of chopping to do. Serve with a chilled, crisp Sauvignon Blanc and enjoy! Season salmon with juice of half of the lemon and Tony’s to taste. Grill to medium-rare or medium doneness (depending on your preference) and set aside. While the salmon is cooking, add a dash of olive oil to a medium saucepan over medium heat. Add quinoa and toast for about five minutes, stirring occasionally. Add chicken broth, season to taste with salt and pepper, and bring to a boil. Reduce heat and cover, simmering until broth is absorbed, about 15 minutes. Remove from heat and set aside. At the same time, preheat oven to 370 degrees. Place asparagus on baking sheet and toss with olive oil, salt and pepper. Roast asparagus in preheated oven, about 10 minutes. Remove and set aside to cool slightly. To toast the pine nuts, place a small skillet over medium heat. Add pine nuts and stir frequently until lightly toasted. Remove from heat. To serve, divide the arugula evenly among four plates and top with quinoa, asparagus, sun dried tomatoes, onions, pine nuts and feta cheese. Serve salmon on the side and drizzle all with vinaigrette! I based the recipe for the dressing on this recipe on Epicurious.com. I tweaked it by omitting the honey and the hot sauce just out of personal preference, but you could certainly leave those in. Whisk together the garlic, mustard, vinegar, lemon juice, salt and pepper in a medium bowl. Slowly whisk in the olive oil until the dressing emulsifies. Recently two of my favorite things came together in a most unexpected and delightful way. My absolute favorite magazine – Coastal Living – announced that my favorite town in Michigan – Grand Haven – had been named the 2017 Happiest Seaside Town in America! Grand Haven beat out nine other cities across the country and was the only town on the list that isn’t actually anywhere near an ocean. Coastal Living ranks each town using the Gallup-Healthways Well-Being Index, which includes percentage of sunny days, healthiness of beaches, walkability and more. When the contest was announced back in September, I shared the link on Facebook and must have voted a thousand times. Although not technically a seaside town, Grand Haven rests on beautiful Lake Michigan, which looks like it could be the ocean (minus the salt and sharks). 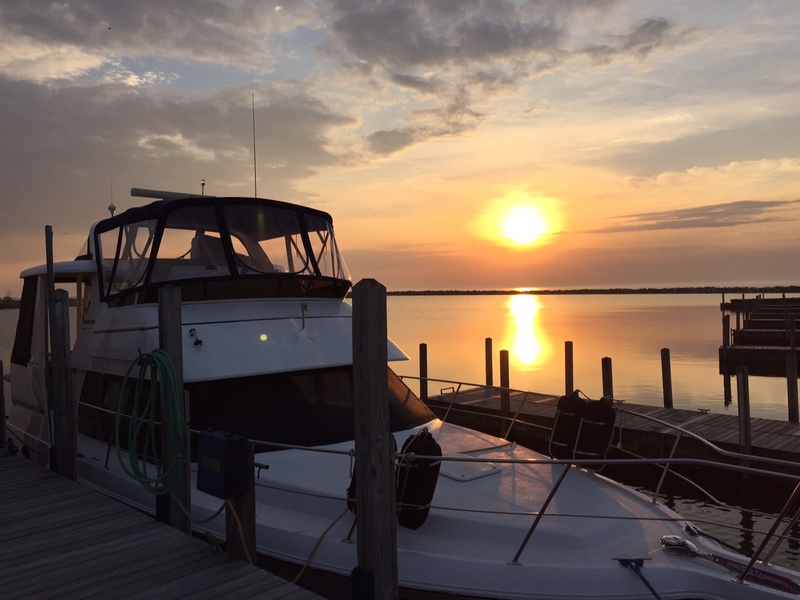 And Grand Haven has plenty of “coastal vibe,” one of the traits Coastal Living looks for when ranking. Plus the community has fun activities all year long, great restaurants with plenty of outdoor seating, some awesome fireworks displays, and of course we can’t leave out the one-and-only musical fountain. You’re probably wondering how these two things all came together in my little world. On Friday, January 27, Grand Haven was announced as the winner of the Coastal Living contest, which was of course very exciting and wonderful. But it just so happened that Rich and I were spending that weekend at the lakehouse because we wanted to check out some of Grand Haven’s Winterfest activities. However, it was bitterly cold that Saturday morning, and there were WAY more people going to the event than we expected, so we opted instead to spend some time shopping in downtown Grand Haven. While we were in one of the local shops, we overheard a group of women telling the sales clerk they were from Coastal Living magazine and were in town to spread the news about the win. I immediately beelined over and butted into joined the conversation. Well, they were as friendly and enthusiastic as I could have hoped, and we had a lovely chat. Rich and I were about to leave and then I decided I would be remiss if I didn’t ask for a picture. Naturally, they were totally game and we all grabbed Stormy Kromer hats from a display and gathered around for a photo. To read the Coastal Living story, visit here. And be sure to look for the feature story on Grand Haven in the May 2017 issue of Coastal Living. 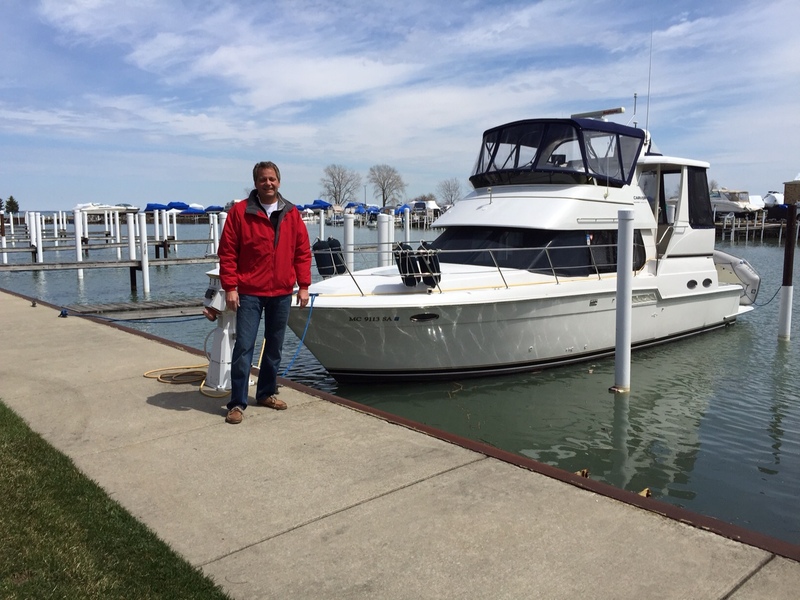 Recently Rich and I embarked on a big adventure: bringing our new-to-us boat from a marina in St. Clair Shores, Michigan to our lakehouse in Spring Lake – a trip around the Mitten State that totaled nearly 400 nautical miles. Captain Rich with his new boat right after we did the sea trial. When we first looked at the boat, a 2000 Carver 404, it was in the middle of January and boating season seemed like it was a million miles away. 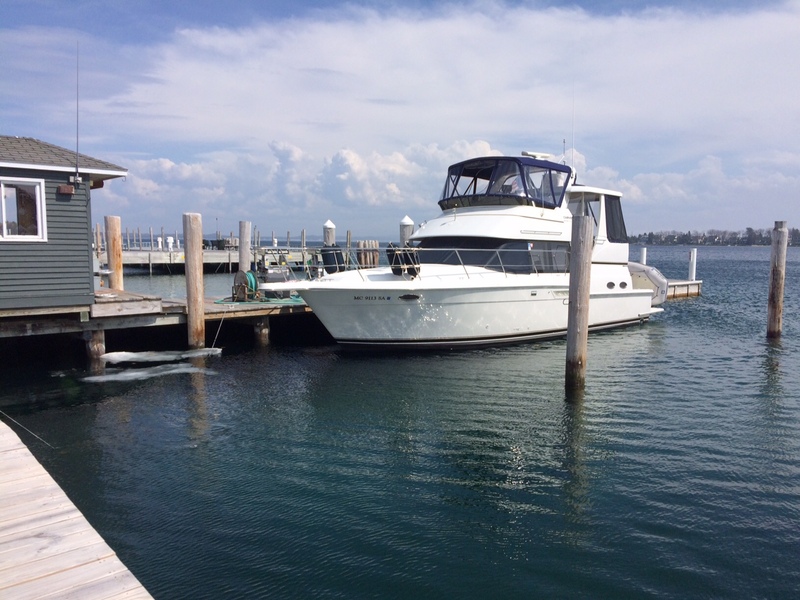 The sea trial was scheduled for a Saturday morning in April, so we slept on the boat the night before. We both slept well and were excited about the idea of spending many more overnights on this boat than we did on our old one. 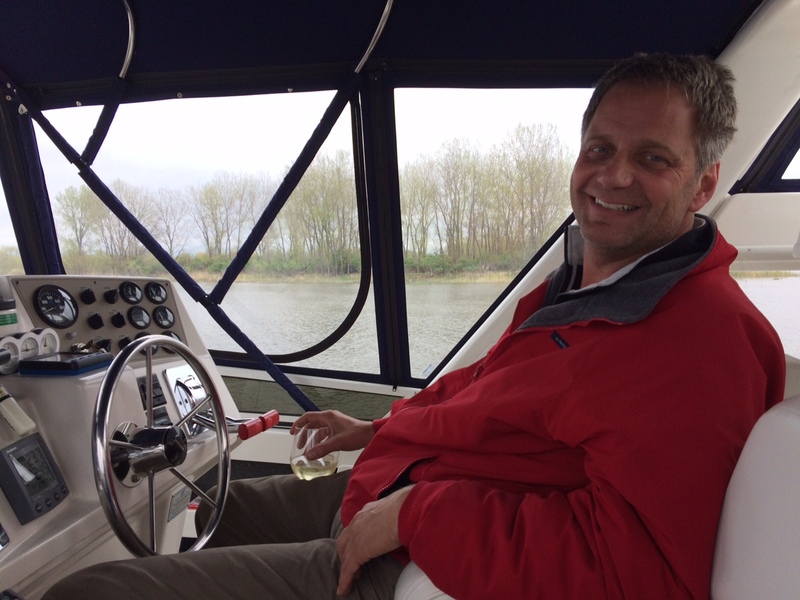 The morning of the sea trial was bitterly cold and gusty – challenging circumstances for Rich to try driving his new boat for the first time. It all went fairly well though and got us excited for our big solo excursion. The night before our big trip. The morning of our departure was a foggy one and we were delayed by a couple of hours. Finally it lifted enough for us to be able to leave the marina, and it turned out to be a nice sunny day. 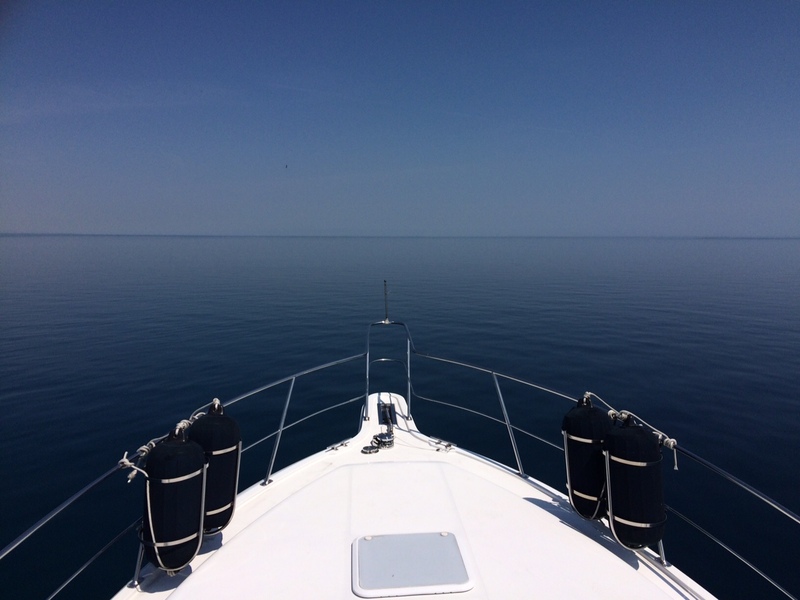 The trip through the St. Clair River was uneventful, and after we passed under the Bluewater Bridge, we were treated to a breathtaking view of the clear, calm, deep blue waters of Lake Huron. Entering into Lake Huron. I felt like we were on a space ship launching into outer space. Our first day, Thursday, turned out to be the only day I was able to work on my tan. I discovered that the aft deck is a heavenly place to lie in the sun, especially with a glass of wine nearby and jazz playing in my headphones. My pale, dry Michigan legs are in desperate need of a tan. We spent the evening in Harrisville Harbor. Rich had made reservations for our two ports of call and because it was such a slow time of year, he was able to call ahead and get help from the harbormaster, greatly reducing the stress for the first mate (especially considering that my sole boating skill consists of doing the splits when jumping onto the dock to tie off the spring line). The harbormaster recommended a pub that was in walking distance from the harbor, and we had a relaxing meal there. Harrisville is a nice little town but quiet. Quite different from the resort towns on the west side of the state, which are thriving and filled with quaint boutiques and eateries. On the bow of the Just Like Heaven in our first port of call. The next morning Captain Rich let me take a quick shower at the marina, and we hit the water right around 7:30 a.m. We saw a beautiful sunrise, but the day clouded over quickly and got chilly. 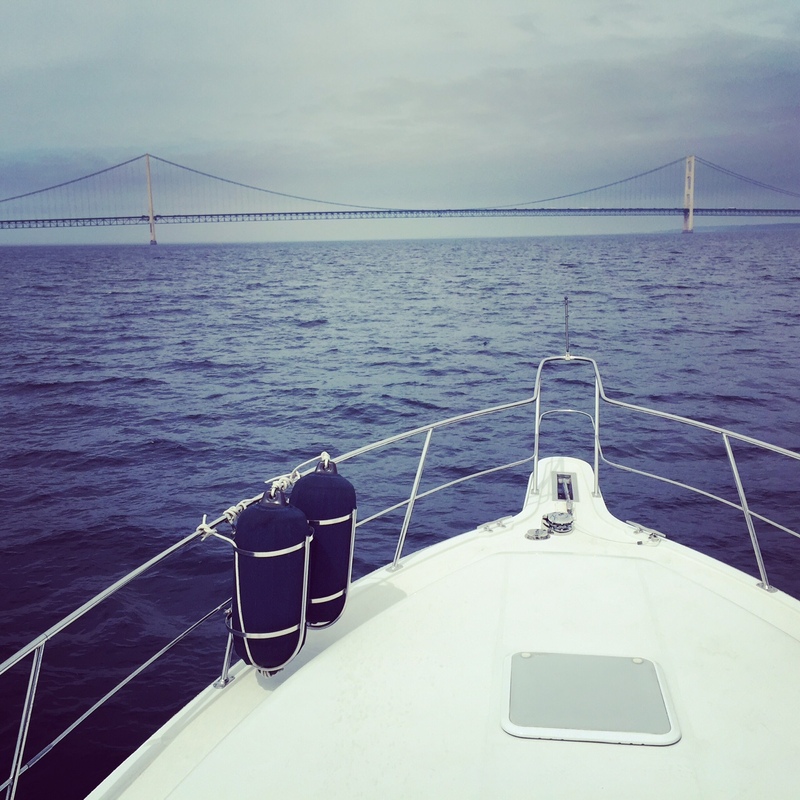 I was a little disappointed that the sun wasn’t shining when we passed under the mighty Mackinac Bridge, but at least it wasn’t raining. This sight never gets old. The stunning Mackinac Bridge. Shortly after we made it into Lake Michigan, the water became extremely choppy and fog rolled in. It was a pretty hairy ride for a while. But when we stopped in Harbor Springs for fuel, everything seemed to calm down and the sun was out so we decided to push on to Leland where we had a reservation for a slip. Stopping for fuel in Harbor Springs. There was still ice in the marina! Unfortunately the fog and rough water came back and the ride into Leland was another nail biter (for me anyway – Rich handled it all like a pro). We couldn’t even see shore until we were almost right on top of it. 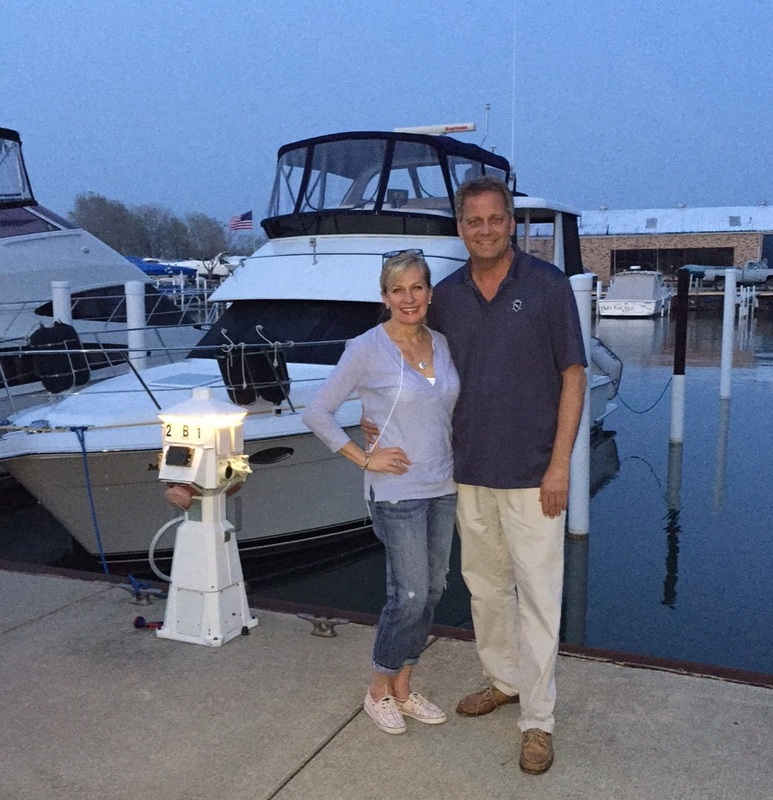 But the harbormaster was waiting to help us so docking was fine, and we enjoyed a fun evening with our friends Jeff and Norma who came over from their cottage in Traverse City. Both of us are sporting some serious boat hair, but we were extremely pleased to have made it safely to our second overnight port of call. Saturday, home stretch day! The weather was pretty miserable – drizzly and really cold. We showered quickly and I picked up breakfast sandwiches from a nearby diner, then we set out. The water was rough again – not choppy but big rollers – and again we had fog. At one point Rich had me take the helm while he went to check some stuff below. I was nervous and it gave me a new respect for his captaining abilities. The fog continued to thicken and by the time we got to the Grand Haven channel, it was like pea soup. Fortunately, there were very few boats in the channel, and Rich’s keen navigating skills prevented us from colliding with anyone. We had to call ahead to have the Spring Lake drawbridge lifted and while we waited, we idled and drank a glass of wine together. We were both elated and considered the trip a complete success! I was also extremely proud of my fiance for his adroit handling of his new boat, how quickly he learned all the equipment including the radar, and how well he navigated some seriously rough waters. All in two and a half days to boot. This was no small feat! Success!! Back in familiar waters, he’s finally able to relax. 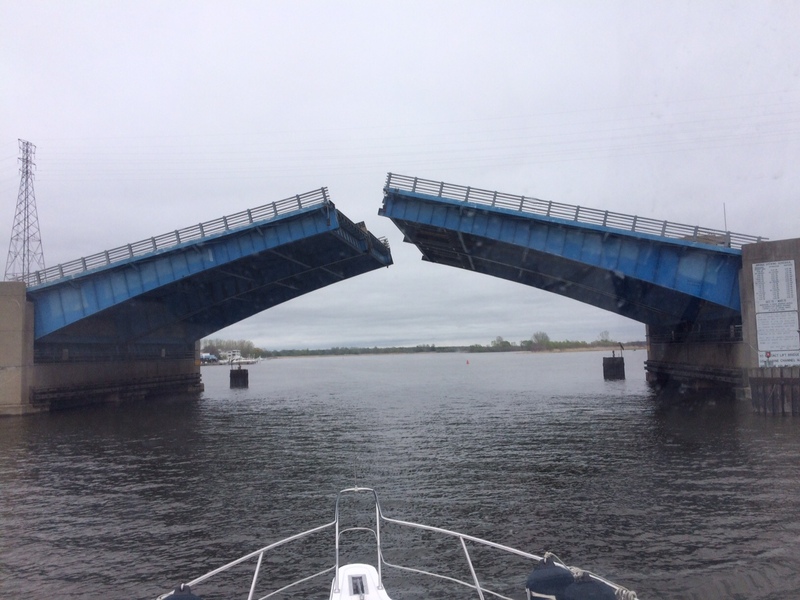 Drawbridge into Spring Lake. We’re still not sure if we need to have it raised for us to pass under, but we didn’t want to take any chances the first time. We were so happy when we finally rounded the corner into our beloved Laguna Bayou. Laguna Bayou – a welcome sight! Docking at the dock at the lakehouse was a piece of cake. The boat looks beautiful in her home slip! The Just Like Heaven in her home slip. The old Rinker looks dwarfed in comparison. Even though the boat’s bathrooms (in particular the master bath) are nicely sized, it’s much easier to take a shower in marina bathrooms. On such a big boat, it’s hard for the first mate to be of much assistance to the captain. Doing the splits between this boat and a dock would probably send me to the hospital! Preparing meals when you’re cruising, even on a big boat, is challenging, and you probably won’t end up doing much. It’s much easier to bring stuff that’s pre-made (and easy to eat) or to buy prepared food onshore to eat while cruising. Sleeping on a boat is heavenly. Most wine glasses don’t fit in the cup holders. So that’s the story of our 2015 Pure Michigan Around the Mitten trip. All in all it went like clockwork, and we can’t wait to take the Just Like Heaven on many more adventures. Several years ago my friend Norma and I took part in a “Holiday Decorating on a Shoestring Budget” workshop at a magical place in the countryside of southwest Michigan, Southern Exposure Herb Farm. We were delighted with the experience (you can read more about it here) and finally got a chance to go back recently. Here we are in the Hog House, where the cheese demonstration took place. 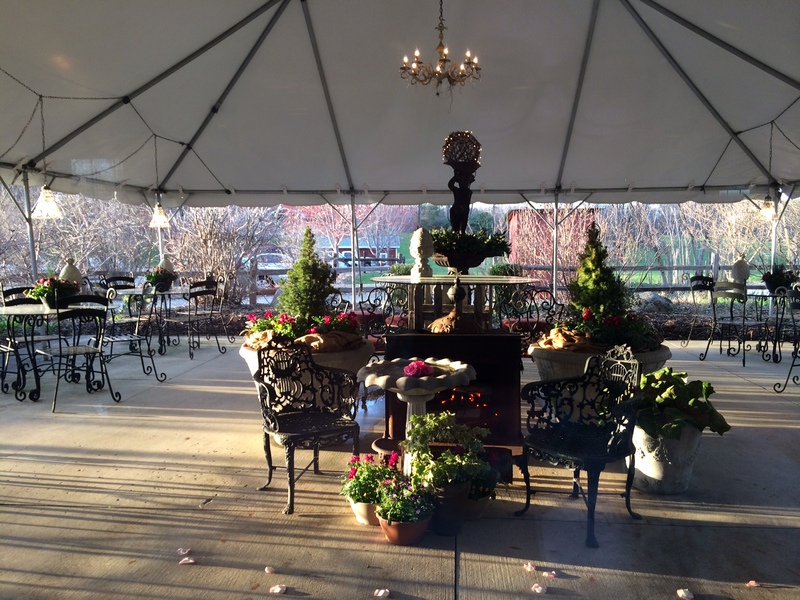 The retreat we took part in this time was the European Hanging Basket and Herbes de Provence Dinner. It was a little early in the season for many spring flowers to be appearing on the farm yet, but the place still looked enchanting and it was nice to be able to see it in the daylight. The owner, Curtis Whitaker, remembered Norma and me (or seemed to) which we found very charming. Two other groups of ladies were at our table but they all seemed to want to converse among themselves, so Norma and I had a chance to chat and catch up (and share the carafe of white wine conveniently placed in front of us). 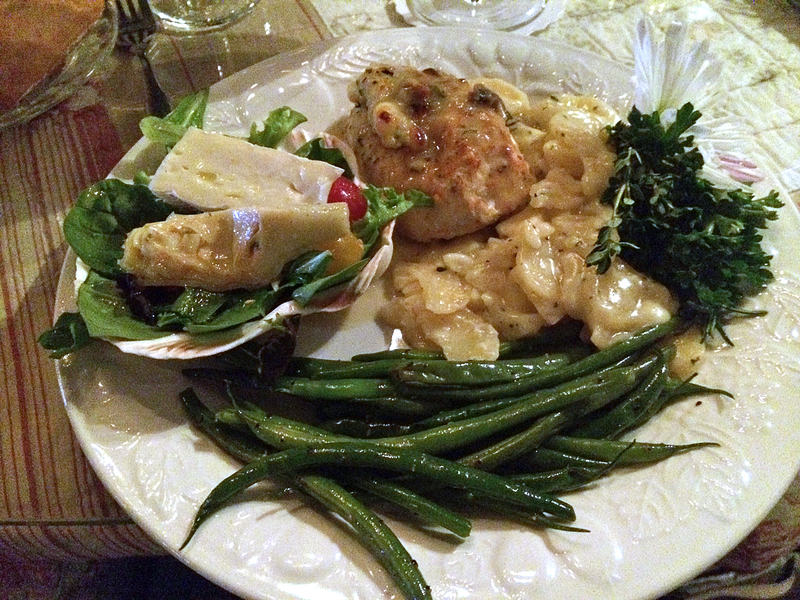 The food was sublime: homemade bread with herb butter, chicken stuffed with brie, a fresh green salad with artichokes and more brie, haricots verts, and the most amazing scalloped potatoes I’ve ever had. Since both of us have been trying to detox and eat clean for the past several months, the meal was beyond decadent; in fact, neither of us could finish our plates. The dinner was followed by apple pie with lavender ice cream, which Norma didn’t touch but I had to at least sample. It was absolutely amazing; I never thought I’d like lavender flavored anything but the ice cream was wonderful. The photo doesn’t do the dinner justice. Those potatoes! Following the dinner we were split into groups and moved to different areas of the farm where the resident experts gave us a variety of demonstrations. My favorite was the lesson on how to make the perfect mojito. Muddle the mixture and add 1.5 – 2 oz. rum and ice. Top with club soda and stir. Take a small mint bunch and give it a “slap” to release the scent; place in glass as garnish. Finally, we ventured into the tented workspace where we put together our baskets. The baskets were already filled with the individual plants, so all we had to do was take them out of the containers and make room in the baskets for everything, then cover it all with moss to hide the soil. 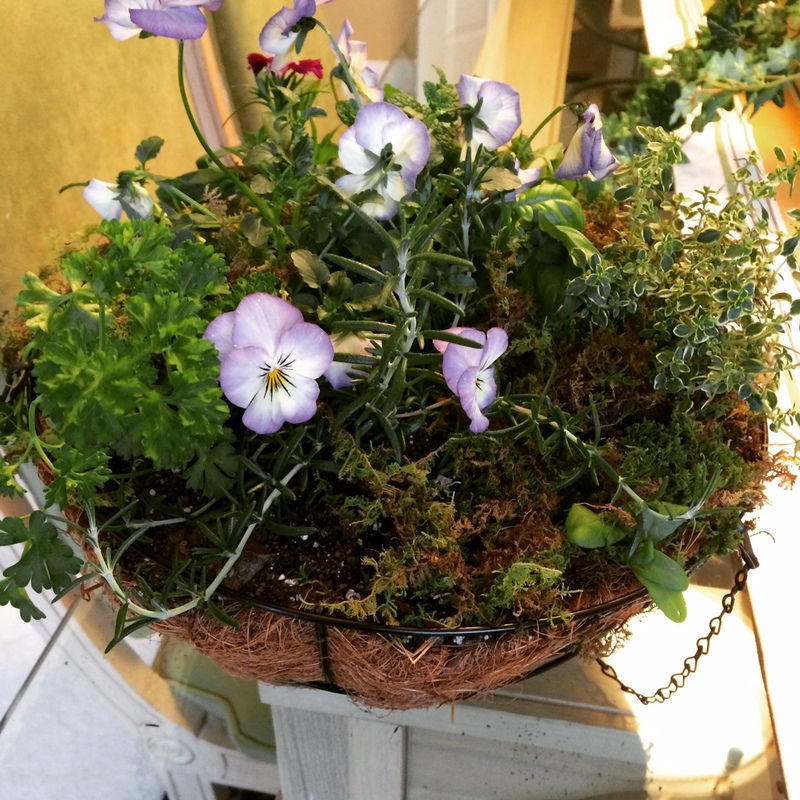 The baskets are filled to the brim with edible flowers, herbs and scented botanicals that are meant to be snipped and used for cooking and drinks all season long. Here’s the finished basket. It needs to be hung in full sun with good ventilation, and the plants should be trimmed regularly to keep them full and healthy. I can’t wait to hang mine at the lakehouse to enjoy all summer long! Herb butter is easy to make: make sure to use sweet cream UNSALTED butter that is at room temperature (but not runny). Mix in 8 lemon thyme leaves and 8 chopped rosemary leaves (no stems), place into a pastry bag and pipe onto baking sheet; freeze and use as needed. Herbed brie is a simple, delicious appetizer: trim the rind off the top and sides but leave it on the bottom so it can served as a base. Sprinkle the top with chopped rosemary, basil, lemon thyme and lemon zest. Slice into small pieces and place onto individual crackers an hour or so before your guests arrive. For the best homemade pesto, use Pecorino cheese. Plant creeping rosemary in strawberry jars. As the lemon thyme spreads in your basket, add soil to the tentacles (mist with a bit of water). This will help it grow. In the garden, press the tentacles of creeping herbs into the soil. Violas are lovely as garnishes on cupcakes or muffins. Use a bit of honey to make them stick to the top. Southern Exposure is truly a hidden gem in southwest Michigan. If you have the opportunity to visit, I highly recommend it. It’s a wonderful outing for friends, sisters and mother/daughter groups, book clubs and bridal parties. They offer a plethora of hands-on workshops in the spring and fall, as well as theme dinners, bus tours, garden weddings and travel adventures around the world. To learn more, visit here. Just make sure to sign up early because all of their events fill up fast! 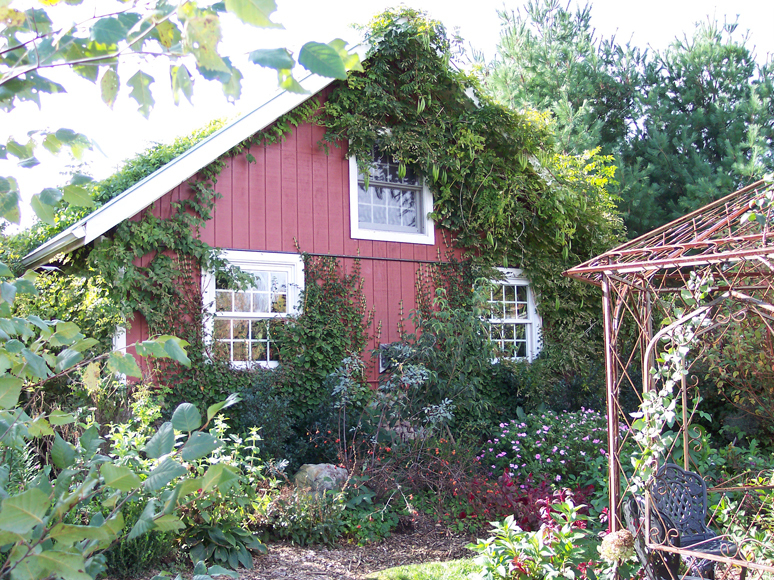 Here’s one of the buildings at Southern Exposure with the gardens in full bloom. One of the things I’ve loved doing is taking pictures of the bayou our lakehouse is situated on. I love capturing the changing light, leaves and water. The changes from season to season are the most dramatic, of course, but subtle shifts happen even from moment to moment. Spring Lake is unusual in that it is very long and narrow with a ton of little bayous and bays. Some of the larger bayous have names but there are many smaller ones that don’t, at least as far as we know. 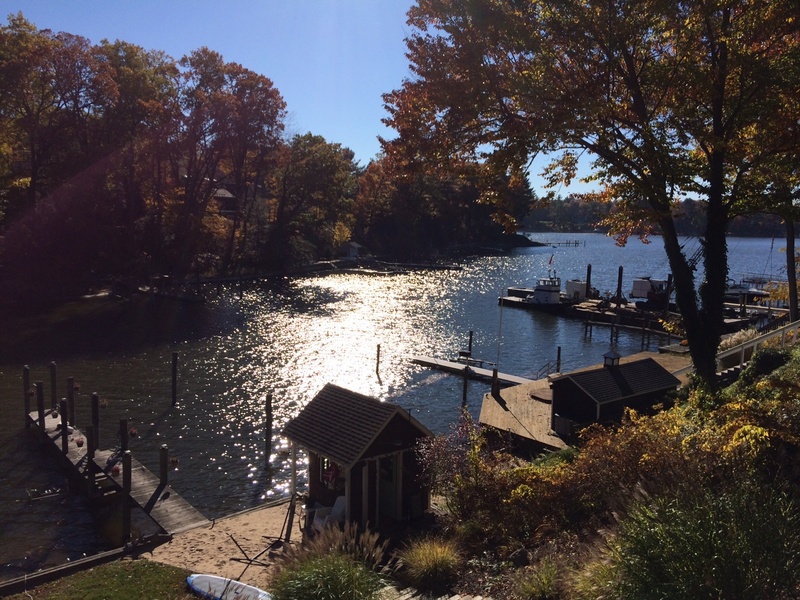 We used to drop anchor in an unnamed bayou that we dubbed “Spartan Bay.” When we bought the lakehouse, we weren’t aware of a name for our little bay so we named it “Laguna Bayou” after one of our favorite places – Laguna Beach, California. Here’s the first bayou shot I took, shortly after we took possession of the lakehouse. 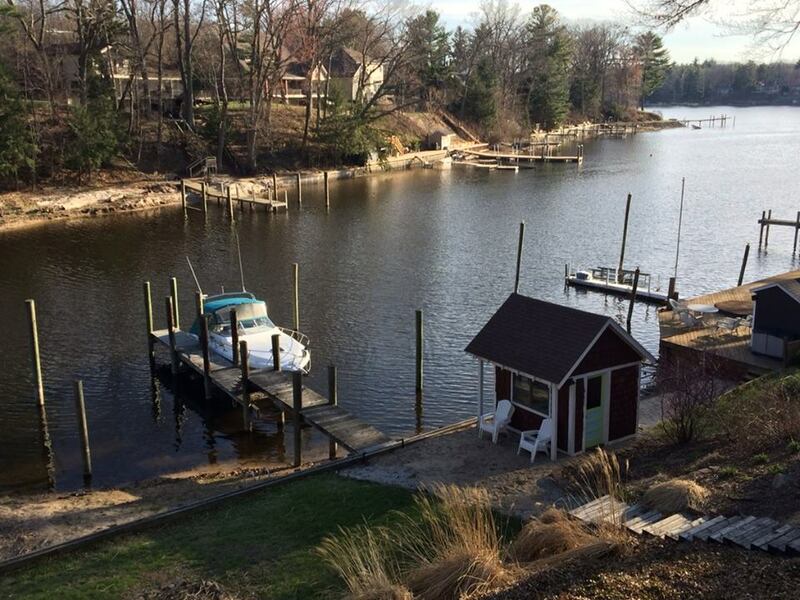 This was a happy day, because we had just gotten the boat out of storage and brought it to the dock for the summer! Here’s Just Like Heaven, all ready for summer. 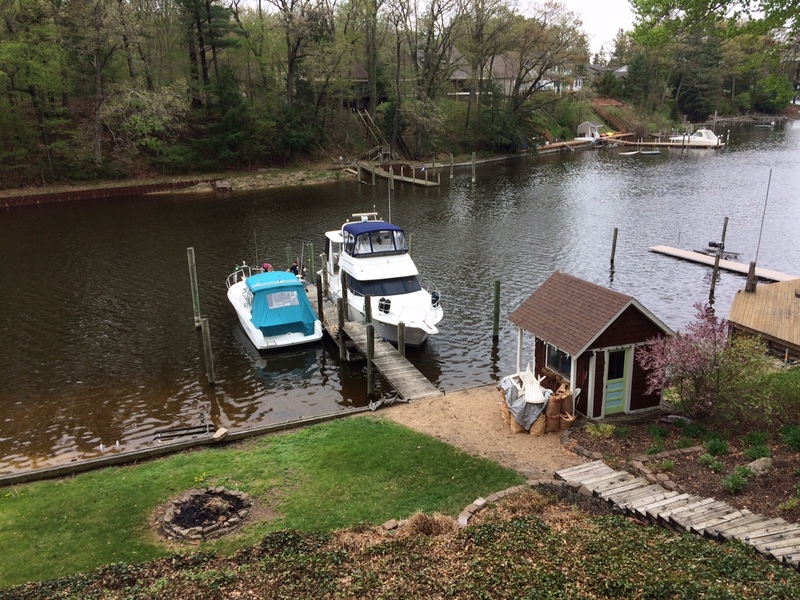 Judging from the lack of boats in front of our neighbors’ cottages, we may have been a little over-eager to get our boat into the water. This is the bayou in early summer, late in the day. I love the golden glow from the late afternoon sun. This shot is the one that’s featured in my blog header. It was taken in the middle of the afternoon on a beautiful Sunday in July. I had a heavy heart when I took this because it was time to head home. There’s nothing sadder than having to tear yourself away from this! Here’s another late afternoon shot taken toward the end of summer. 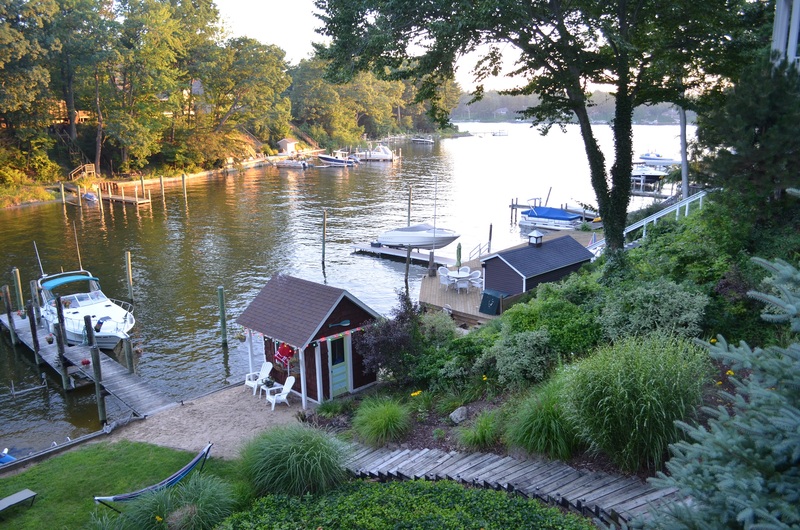 You can see the tiki lights that we added to the boathouse. Rich really wanted to have at least one gaudy decoration at our new place, so this is what we decided on. They’re actually super festive and fun! This was a gorgeous fall day, with the leaves just starting to reach peak color. We had just taken the boat over to be stored for the winter. 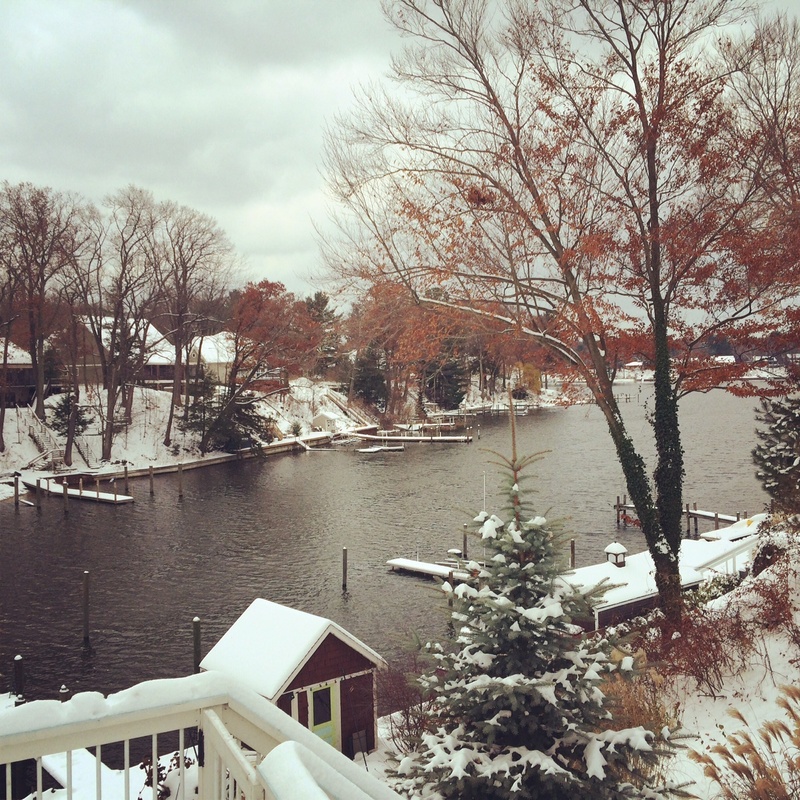 We got an early snow in mid-November, while there were still leaves on some of the trees. 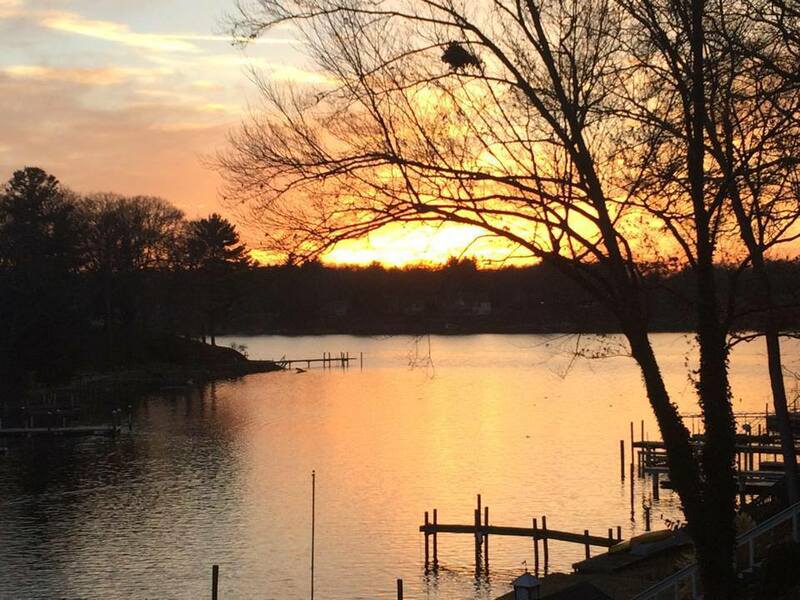 We went back to the lake the day after Christmas and there was no snow, but I loved this beautiful sunset. Rich’s sister and brother joined us for New Year’s Eve at the lakehouse. I caught this shot right after we got there as the sun was setting. I love the combination of colors with the periwinkle clouds and the pink sunset. Then just yesterday Rich was snowed in for a while, and he sent me this shot of the lake effect snow that had hit the west side of the state. It was amazing because we had nowhere near that amount of snow in the Lansing area. This picture almost looks like it has a black & white filter on it, but this is actually full color! I don’t think I’ll ever tire of capturing the changing beauty of our bayou, and I’m especially looking forward to seeing it all decked out for our big event on July 25.